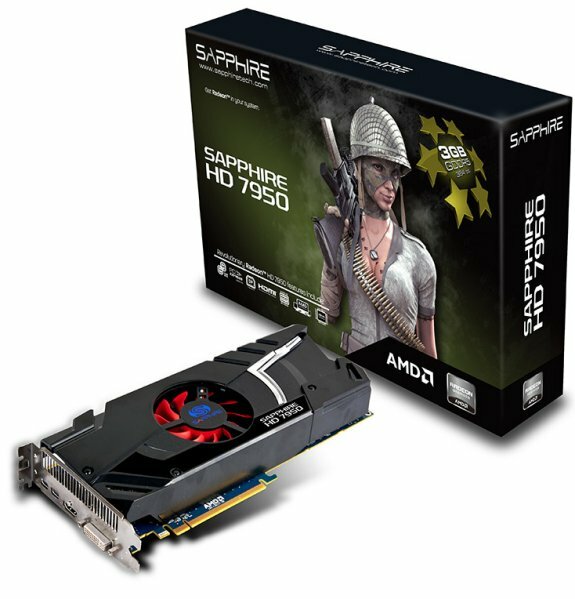 The new SAPPHIRE HD 7950 models are only the second family of graphics cards to incorporate the latest generation of GPU’s from AMD built in a new 28nm process and featuring the new GCN optimised graphics processing architecture. The HD 7950 GPU has a new internal structure with 1792 Stream processors and a 384-bit high speed memory interface with over 264GB/sec memory bandwidth. Two models are being introduced at launch. The standard SAPPHIRE HD 7950 ships with a core clock speed of 810MHz, slightly higher than the reference design, and a dual slot, single fan cooler. At the same time SAPPHIRE is introducing a high performance model, the SAPPHIRE HD 7950 OC Edition, which is factory overclocked to 900Mhz and features SAPPHIRE’s new dual-extractor technology - Dual-X - a highly efficient multi-heatpipe cooler with dual fans providing quiet and very cool operation during normal operating conditions, and superb cooling performance even under extreme load. Both models have a large 3GB array of the latest DDR5 memory with effective clocks of 5Gb/s. For enthusiasts wishing to maximise performance, a new version of the SAPPHIRE overclocking tool, TriXX supporting this latest generation of technology is available free to download from the SAPPHIRE website. TriXX allows tuning of GPU voltage as well as core and memory clocks, whilst continuously displaying temperature. Manual control of fan speed is supported, as well as user created fan profiles and the ability to save up to four different performance settings. Both of the SAPPHIRE HD 7950 models have a dual BIOS, allowing for further experimentation by the enthusiast. On the OC edition, the second BIOS is pre-programmed to allow a higher maximum overclock and more aggressive fan profile. Working or gaming with multiple monitors is becoming increasingly popular, and the SAPPHIRE HD 7950 supports this with AMD Eyefinity. With its DVI, HDMI and two mini-DisplayPort outputs the card can support configurations of up to 6 monitors. In addition, the SAPPHIRE HD 7950 can simultaneously output multiple, independent audio streams allowing the correct audio content to be associated with different applications on different screens. 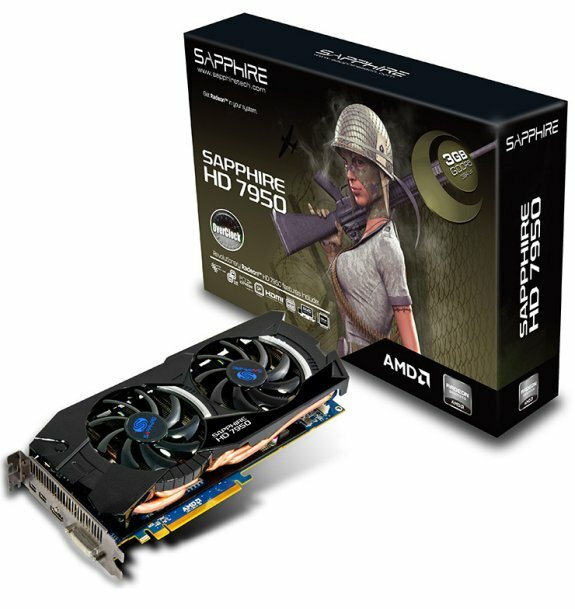 The SAPPHIRE HD 7950 and HD 7950 OC are now available through SAPPHIRE’s established channel and etail partners.